With few exceptions, cells don't change type once they have become specialized -- a heart cell, for example, won't suddenly become a brain cell. However, new findings by researchers at UC Santa Barbara have identified a method for changing one cell type into another in a process called forced transdifferentiation. Their work appears today in the journal Development. With C. elegans as the animal model, lead author Misty Riddle, a Ph.D. student in the Rothman Lab, used transcription factor ELT-7 to change the roundworm's pharynx cells into intestine cells in a single-step process. Every cell has the genetic potential to become any kind of cell. However, the cell's history and the signals it receives changes the transcription factors it contains and thus determines what kind of cell it will become. A transcription factor is a protein that causes genes to turn on. "This discovery is quite surprising because it was previously thought that only early embryonic cells could be coaxed into changing their identity this readily," Riddle said. "The committed cells that we switched are completely remodeled and reprogrammed in every way that we tested." Switching one cell type into another to replace lost or damaged tissue is a major focus of regenerative medicine. The stumbling block is that cells are very resistant to changing their identity once they've committed to a specific kind. "Our discovery means it may become possible to create a tissue or organ of one type directly out of one of another type," says Joel Rothman, professor in UCSB's Department of Molecular, Cellular and Developmental Biology, who heads the lab. Riddle and her colleagues challenged all C. elegans cells to make the switch to intestine, but only the pharynx cells were able to do so. "We asked skin cells, muscles, neurons to change but found that only the cells in the pharynx were able to transform," Riddle explained. "So this brings up some big questions. Why aren't other cells changing their identities? 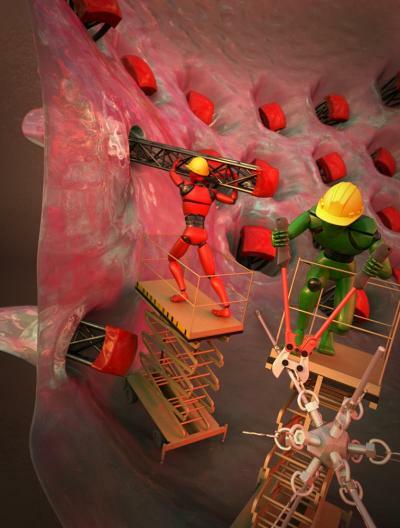 What is special about the cells in the pharynx that allow them to change their identity into intestine? "Since C. elegans is such an incredible model system we can really tackle these questions," she continued. "By knocking down certain genes and manipulating the animal, we can begin to better understand the conditions under which skin cells and muscles cells might change their identities. That will help us figure out what is special about the cells in the pharynx." 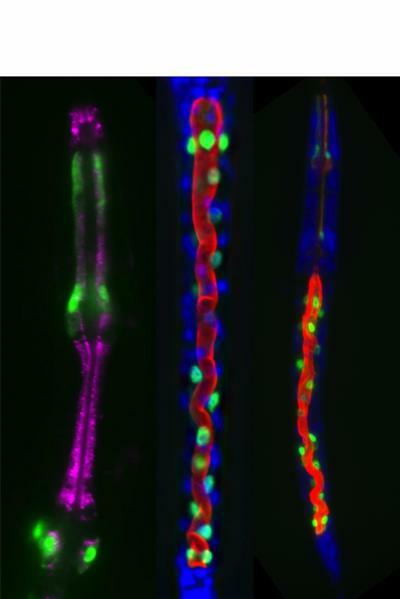 Previous studies in the Rothman lab revealed the cascade of transcription factors required for the proper development of the C. elegans intestine. Used in the later stage of intestine development, ELT-7 continues to be expressed for the life of the animal and has important functions not only in gut development but also in gut function. This study is revolutionary in that researchers have clearly demonstrated that cells are not limited to their original identities. "Think of them as different rooms in a house," Riddle said. "Like cells, different rooms in your house have different structures and functions. Changing the function of a room is likely to be easier if the structures are similar, say, turning a bedroom into a living room or vice versa. But changing the bathroom into a living room presents a bigger challenge," Riddle explained. "Just as some rooms in a house are more easily converted to others, some cell types may be more easily coaxed into changing their identity to another specific type. This doesn't seem to depend on the relatedness of the cells in terms of when they were born or how closely related they are in their lineage." Maybe the heart cell can become a brain cell after all. As demonstrated by another important finding in the UCSB study, the cells remodeled themselves in a continuous process; there were stages in the remodeling process during which the identity of the cell was mixed. "Going back to the home remodeling example," Riddle said, "the couch and television were added to the bedroom before the bed and dresser were removed." "The key importance of our finding is that we have observed cells undergoing a process of morphing in which one specialized cell type is converted into another of an entirely different type," Rothman said. "This means that it may be possible to turn any cell into any other cell in a direct conversion. In terms of our understanding of biological constraints over cell identity, we've shown a barrier that we believed absolutely prevents cells from switching their identity does not exist. It may one day be possible to switch an entire organ from one kind to another."